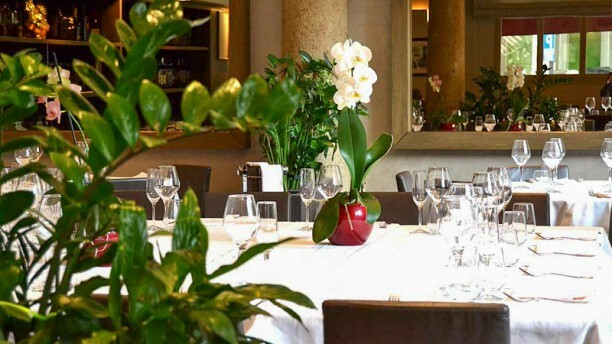 Sorbet and ice cream "Repubblica"
In the heart of Milan, in Repubblica district, close to the historic grand hotel Westin Palace and Principe di Savoia, Piazza Repubblica Restaurant welcomes its guests in an environment of informal elegance. In the kitchen Alex “Brembo” Brambilla alumni of Sergio Mei at the Four Seasons. And that’s how Piazza Repubblica’s dishes are born, with the daily shopping of fresh products and the personal relationship with suppliers. The entrecot was a bit tough and not as tasty as we had expected. However, the Osobuco was very, very good. We also misunderstood the price of a half bottle of wine (it was €40 rather than 14...:), a lost in translation moment? ). Staff was very helpful otherwise, and except for the wine surprise, all was as expected at the end. Top quality good and super professional staff! We were looking for traditional food in Milan. We were greeted very nicely, service was friendly, most of all food was excellent. Vesl Ooso Buco and Veal Milanese were excellent. Presentation and service was good but for the price, (12 Euro cover charge/person just to start) the food should be better quality. Restaurant is not as good as it makes itself out to be. We went there, they have our reservation ready. We were sitting in a quiet place, but when we arrived it was quite early so the restaurant was almost empty. Overall, the food was very nice and the place looks cozy and welcoming. Wonderful lunch - excellent quality, great classic dishes: tasted the "puntarelle" which were perfect and the braised beef cheek which was a just dream. Slightly on the pricey side, but well worth it. A restaurant with high level of food and service quality. A pleace I always come back to. My full recommendation formpeople loving excellent food and service! We had a rather late dinner, after watching a performance at La Scala. They put us in the smaller, more isolated, almost empty room, where the only pleasant thing was looking out of the window. The service was cheerful and the food and wine were really good. The prices were rather high and there was a 4-euros cover charge per person. A bottle of still water was 4 or 5 euros. We were taught an expensive lesson to always check possible extra charges in Milan restaurants. Very friendly service and the food was wonderful . We had the special white truffle risotto And the veal cheeks both were excellent. Recommended for all! Long on style, short on substance. The food was incredible, service friendly and Marco introduced me to a lovely wine that paired perfectly with the main dish. Just go, unless you are only looking for pasta, this is a memorable gastronomic experience. Must try White truffle resotto, Foie gras. Nice restaurant and service. Food was not up to our taste - too heavy is the word. We Visit RPR on our stays in Milan.